I’ve owned the Apple iPad2 for a year now and cannot imagine giving it up. 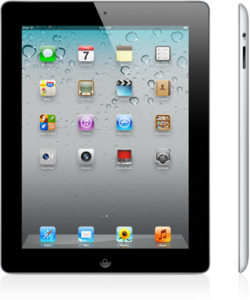 How does a frugal mom come to purchase the iPad? She doesn’t, her husband wins one from his company’s healthy living incentives program. She hesitantly starts using it sure that it is just a bigger version of her iPhone until she is surprisingly proven wrong. The iPad is an efficient way to do everything you previously have done using your home computer or laptop. But the iPad requires no cords, except for the charger which is similar to the charger for the iPhone. With the iPad there isn’t the wait time there can be when using a home computer with a full memory or a ton of viruses and spyware programs open. Also the iPad is phenomenally portable and light weight. I can balance it on my lap and type while holding a feeding infant, I prop it on my countertop and use it for my recipe book, I teach my four year old to read using the Dr. Seuss book app. My 7 and 8 year olds practice their math facts on it and then for a reward they get to play angry birds. Much of this you can do on the iPhone or other smart phones, but the iPad has a much larger screen and allows the adult to actually use their phone while still keeping children and husbands occupied with the various apps. An especially useful application of the iPad is the ability it gives me to print from it. I can print anything I want from the iPad and it goes right to my home printer. I can take pictures with my iPad and upload them to my blog or Facebook. The possibilities are endless. The iPad is extremely useful. I have not had one problem with it’s function or durability. We did purchase a cover for it for about $10. My one year old has repeatedly walked on it, cringe, and it is still as good as new. Our home PC is gathering dust and the thought of waiting for our PC to turn on and load up seems archaic compared to just opening the iPad cover and checking email,Facebook, and exploring the Internet within seconds. I am frugal, so much so that even when finding a shirt on clearance at Target for $7.99 I still manage to think it’s too much. That being said, if we lost this iPad I would be at the store that day purchasing a new one without a second thought. I am a SAHM to five children age eight and under. We currently live in South Carolina. I studied Microbiology at BYU and Elementary Education at Murray State.